Today I share an article that I wrote in my first teacher training in India. The same time I was just finishing my last essay for university with the heading “Femininity – between dualism, deconstruction and spirituality”. Femininity always has been a big subject to me. I guess because it also was in some way in my family. I grew up in a family of women: independent, strong, – standing their man (german expression of living your inner man in exterior life). There was nothing a women can’t do. I was inspired by these women and grateful for the family I grew up in. But I also realized (and observed in myself) that this role of “being your own man” can you make become strict, rigid and rough. Loosing softness and being at ease. It may disconnect you to the feminine qualities of yourself (just as men are already disconnected from it). And when you deny a part of yourself (no matter what you call this part), you are not truthful. Not free, nor independent. What remains is a sense of being incomplete. So here I leave you some ideas about the femininity, what it means and how we and society treat it. And of course, how Yoga helps you to bring yourself back in wholeness, connection and harmony. Hope you enjoy. And as always you are welcome to leave comments. WHAT is feminine? WHO is feminine? What means TO BE feminine? Why does femininity seem to be secondary? Ans masculinity has become a dominant and necessary attribute to achieve? And how is all that related to our yoga practice? Femininity is a category, that has been loved, worshipped, politically discussed, revolutionized and deconstructed by society and its discourses. So, it doesn’t surprise that nowadays people are confused when it comes to this term. And women come to ask themselves: What does it mean to be feminine? But how many men are wondering about the same question? Which men is asking: What is my femininity? We shouldn’t forget that femininity is nothing owned by women. It’s part of an energetic concept. And so present in everyone, everywhere, in women — and men. We have to understand that we always have both. We are both. Or don’t you like to have an empathetic, sensitive man? Someone who cares and can simply listen to you? Well, those attributes are normally considered as feminine qualities. In Yoga we’d say together with the masculine energy they represent the polarities of our personality, the aspects of our inner (and outer) life. Now, how can we see these energies connected to our yoga practice? In Veda Tantra (the origin of Hatha Yoga), and the Advaita Philosophy you believe that by the creation of the world, the energies of the divine whole have been fallen apart: earth and heaven, men and women etc. were created. You can see, how femininity and masculinity is integrated into a long list of dualities. 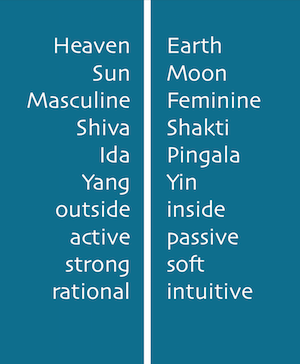 And we shouldn’t forget that the two energies got different names in different contexts, such as: Shakti and Shiva, Yin and Yang, Ida and Pingala. The feminine side is represented in Shakti, Yin or Ida. But what is behind those terms? What is the so called the feminine energy? What we consider here as the feminine is an energy that goes within and just is. So we could say it has some passive characteristic. You go within, observe and just be. It’s about connecting to your interiority, to allow yourself to feel, breath into it, to connect with your own. A person who is in contact with her femininity has a high level of intuition, is rather emotional than rational. She acts out of her intuitive understanding enjoys the moment without questioning, without judging, just living and experiencing it. Nowadays the feminine energy is mainly oppressed, denied or negatively depicted. Especially through the 60’s feminism, when women where asked to be strong and independent, feminine qualities played a second role and masculine aspects like strength, rationality, coldness were to aspire (in order to be equal). Being sensitive was meant to be weak, following your intuition was converting you in an emotional fool with lack of rationality. In our society step by step femininity became the non valued side. Something unimportant to develop or to be in contact with. But this is not real. Trying to put „masculine energy“ first and be fully living out of your rational mind, your intellect is like trying only to breath out all the time. It’s artificial, unnatural and will only lead to exhaustion. Life doesn’t work that way. Women can experience this very lively with their menstrual cycle. When you are aware and allow yourself to feel what’s happening during that period, you can perfectly understand the two energies that complement each other. And both of them (in each of us!) need to have space to be allowed. Life is about balance and harmony. We can observe the terrible results of denying one part of ourselves: Lack of self worth, depression, impaired digestion, menstrual problems and many other health problems. Just think about the term autoimmune disease. It’s a disorder where your own body is acting against itself. Just as you may do with your true nature. How can Yoga help us? Yoga offers a safe space to feel, observe and recognize your completeness. With yoga you can re-connect to your feminine energy — and balance your two energies within yourself. But which is the appropriate yoga style for that? Especially in the western world the more masculine yoga styles are famous: Ashtanga, Vinyasa, Power Yoga. They focus on strength and speed rather than on stillness, receptiveness and release. Even in Hatha classes sometimes you miss the feminine aspects. Which would make a Hatha truly Hatha, respecting sthiram sukham. The principle of balance. Of being stable and at ease. Therefore your breath is always fluid, easy and relaxed. Is that your breath when you practice? Western societies are in a rush, and yoga practice was adapted to that lifestyle. 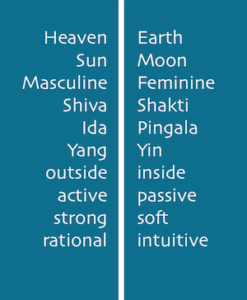 It’s all drawn to be Yang, masculine, heating, fast and active. But now a new yoga style is on the rise: Yin Yoga. With Yin yoga you have the opportunity to find the balance, to make your life, your practice and yourself complete. It creates enough space and time to connect. And the deep, conscious breath allows you to reach the deeper layers of Self. The benefits of Yin yoga are various: physically, mentally and emotionally. As you stay in the poses for quite long there’s time for inner reflection and meditation. It creates a safe space within yourseld. And in this space you find something you need so much but lacks as much in our daily life: TIME. Time to observe, to perceive what’s going on, in your mind and body. Time to simply be. To watch whatever comes up. To allow it to be. To accept. And finally to surrender. Anything that arises is already part of you. And so has to be acknowledged. It’s a practice of cultivating self respect and self love. And this is what brings you not only back to yourself, but into balance and into connection with everything around you. And as some great by-effects it relieves stress, your nervous system gets calmed and your mind stilled (tipp: be patient). In this moment of self acceptance it’s normal to observe emotions. There are the emotions, which in our busy life we don’t allow us to feel. Accept them as part of you at that moment and through your breath let them go. That’s when you truly practice Yoga: You become one with your body, mind and energy. Why do we observe emotions in Yin? This yoga practice works with the meridian system of chinese medicine and our vital energy „chi“. Every meridian in our body is connected to some organs and emotions. For example: forward bends are working on the bladder meridian, which stands for the emotion fear. As you stay in the pose for a couple of minutes, and you breathe into it happens the following: You give your body enough time to reach the deeper levels, trigger them by the stretch and touching them with every breath. It’s like knocking on a closed door and your breath is the key to open. So any fears you hold back and keep inside of you, are no coming back. The beauty is that you can free yourself by the simple act of exhaling and letting them go from a loving attitude. Releasing those stored feelings like anger, frustration, fear, creates space for the new For positive experiences and emotions. It gives you back the energy for your everyday life. That’s what makes Yin Yoga highly healing and it provides the opportunity to connect with your female qualities: self connection, acceptation and sensitivity. Living out this side, in a safe and calm space is balancing the speed and the strength we have to bring up everyday. So make yourself a gift. Create some time and space for Yin yoga, combine it to your daily practice and heal yourself from self destruction.